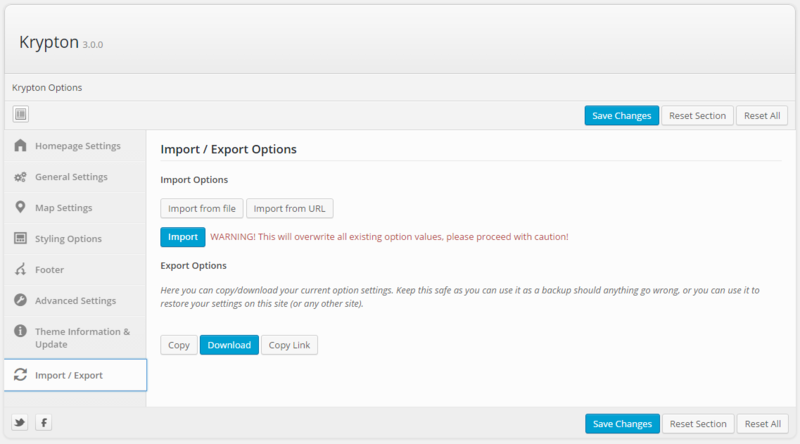 There are 2 alternative options ways to import Krypton Options Data i.e Import from file or Import from URL. Click Import from file button, copy and paste the JSON code from JSON file to text area, then start importing data by clickingImport button. An other way, Click Import from URL button, enter the URL of JSON file to text input, then start importing data by clickingImport button. There are 3 alternative options ways to export/back up Krypton Options Data i.e Copy, Download, Copy Link. Click Copy button, copy the JSON code from text area, paste the JSON code to a text file. The simplest way to back up Krypton Options Data is by clicking Download button, save, then you will receive a JSON file. An other way, Click Copy Link button, the URL will be displayed, then you can download file or show code using that URL.